Blackmagic Forum • View topic - Does the new MacPro output 10 bit via Thunderbolt? Does the new MacPro output 10 bit via Thunderbolt? I cannot seem to get an answer out of folks at Apple. My question is pretty simple: is the video output of the 8 core with D700 GPUs via Thunderbolt (using the latest version of FCPX) 10 or 8 bit? I'd like to buy the new Eizo CG277, but would like to know if I can get a 10 bit output to make good use of the Eizo (which uses a display port input). Second question … when using Resolve, what hardware will I need as an interface to get a 10 bit output to the Eizo display port? A little puzzle about what to buy. While I have a BMPC, I don't have or really need a 4K monitor at this point + there really is no affordable 4K grading monitor out at this point. Re: Does the new MacPro output 10 bit via Thunderbolt? Scott Stacy wrote: I cannot seem to get an answer out of folks at Apple. If by 'using Thunderbolt' you mean just hooking a Mini DisplayPort to DisplayPort cable up between the Eizo and a Thunderbolt port, that will be 8-bit. The only way to get 10-bit at present is to hook up a Thunderbolt video interface. Scott Stacy wrote: Second question … when using Resolve, what hardware will I need as an interface to get a 10 bit output to the Eizo display port? A little puzzle about what to buy. While I have a BMPC, I don't have or really need a 4K monitor at this point + there really is no affordable 4K grading monitor out at this point. 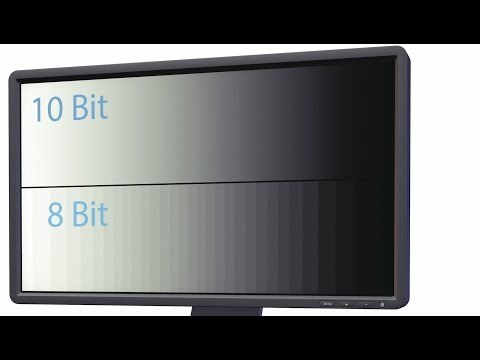 The CG277 says it supports 10-bit over HDMI. So assuming 1080p 4:2:2 is OK, you should be able to do this with nothing more than an UltraStudio Mini monitor and an HDMI cable to the monitor. Note however that the display's 2560 x 1440 native resolution is a little awkward for working with standard video formats — you're going to have to chose between pixel-for-pixel accuracy, and letting the monitor scale the image up so it actually fills the screen. This makes the CG246 rather tempting, since it's native 1920x1080. However, annoyingly, it doesn't do 10-bit over HDMI, only DisplayPort. I think the DisplayPort version of the HDLink Pro would let you bridge that gap (HD-SDI from Mini Monitor to HDLink, DisplayPort from HDLink to CG246). Note that displays sold primarily as computer displays are sometimes quite picky about what video formats they'll accept, so the above is somewhat theoretical. You might want to wait to hear from someone actually using these displays in this way first. Thank you for you very helpful answer. I would be very grateful to hear from other folks about what grading monitors they are using when working in both 1080p and 4K resolutions. Would be nice to have 10 bit color grading capability without have to guess about what might work best. For 10bit HD monitoring from Resolve, I'm using the BMD Decklink PCI>HDMI/SDI mini monitor card in my PC workstation, running HDMI to BenQ's new colour managed 24" PG2401PT monitor. This is an 'affordable' 10bit IPS monitor with a native resolution of 1920 x 1200 but it offers a 1:1 pixel option as well as monitoring in REC709 plus the more common sRGB. Each unit is factory calibrated prior to shipping (with an individual report) but the monitor can be hardware calibrated too, via the 14bit 3D LUT. Note: I am yet to determine whether this monitor will accept true 10bit via HDMI. If BenQ adhere to the HDMI standard, it should. The PG2401PT certainly will accept 10bit via Display Port so if my tests indicate HDMI is only 8bit, then the BMD HDLink box will be required as it will take the SDI input from the Decklink card and convert it to Display Port, maintaining the 10bit 4:2:2 signal path. To achieve 10bit 4:4:4 would require another approach. OS-X doesn't support 10bit at all so if you want 10bit you need to use a Video I/O card - no mini-displayport/thunderbolt adaptor will magically make it work - nor will the HDMI output on a MacPro. update, seems 10 bit video from thunderbolt on a Mac Pro is now supported.. It has been for quite a while. lotech wrote: OS-X doesn't support 10bit at all so if you want 10bit you need to use a Video I/O card - no mini-displayport/thunderbolt adaptor will magically make it work - nor will the HDMI output on a MacPro. Not true at all. It does support 10bit for quite a while (from OSX El Capitan) now and even Resolve GUI preview (forget about accuracy) can be 10bit. You have an option for this in settings. You need correct GPU- one of the AMD dedicated cards, not Intel GPU.